Rick Perry lobbying for Florida dental insurance company. 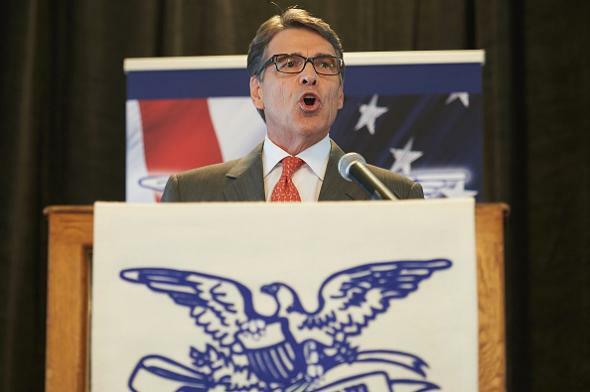 Rick Perry at an event in St. Louis on Sept. 11, 2015. Perry met with the Florida governor in his Capitol office to lobby him on a dental issue near and dear to MCNA Dental, a Fort Lauderdale-based company. … The meeting was set up by lobbying powerhouse Southern Strategy Group, a firm that represents MCNA Dental. MCNA Dental — which has contracts with the Texas, Florida and Louisiana Medicaid programs, according to its website — was the top donor to Perry’s presidential bid, which ended in September, donating $37,800 directly to his campaign, according to OpenSecrets.org. MCNA Dental also gave $20,000 to Texans for Rick Perry, Perry’s state political action committee, in 2010, according to state records. And that’s how your dental public policy sausage gets made. Mmm … public policy sausage!